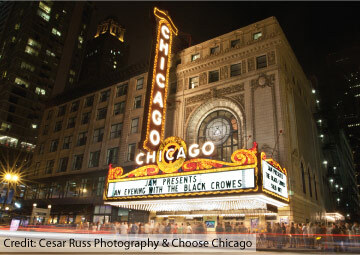 The Chicago Theatre is a national landmark located in the Loop area of Chicago. Owned by Madison Square Garden, Inc., the theatre is a major performing arts venue in Chicago for stage plays, magic shows, comedy, speeches, and music concerts. As an iconic Chicago landmark, the popular attraction is often featured in film, television, artwork, and photography. Convenient parking for The Chicago Theatre is available at the following parking locations. Click on a location listed in the map for more information about parking or to reserve a guaranteed parking spot.